All over the world there are modern day 'Villages' emerging with a multiplicity of forms and a common intent, to become the imaginal cells, the pioneer crucibles that can develop the solutions that humanity needs. The work is of immense value to us all as they model sustainable lifestyles, develop tools, technologies, processes that demonstrate that a Regenerative path is not only a dream but a true potential. Each of these versions of Village offers a story, a leading vision and fulfilling future for humanity. 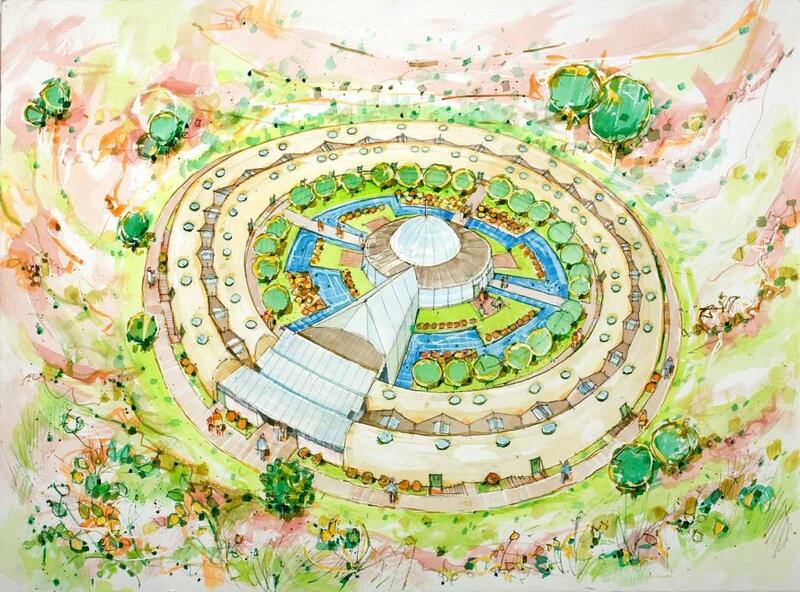 Our interactive Village Design Workshop will allow you to learn the blueprints of a Regenerative Community from a group of people passionate about juicy and high quality conscious community and Whole Systems Design. Come one, come all, bring a guest, and lets design a Village! Restorative Systems as Community-Based Approaches to Transforming Conflict. Wisdom Driven Community Economics - well-being, sharing power and systems that generate wealth for the community. To develop and deepen connection, trust & intimacy while having fun! You are eager to learn how to create a conscious and cohesive community where power is shared and decisions are made together in a way that leverages all individual contributions and the highest good. You want to understand the blueprint of what makes a succesful community in the social, economic, ecological and political quadrants. Along with the "human software" of Village Design, we will also explore whole systems village design for water, food, shelter, energy and "waste" systems and how they intimately interact with and co-create Village culture. You long to embody community in an Integral way, body/mind and spirit. You want to learn about equity, ownership, sharing and circular economies, currencies, entrepreneurship, finance and all aspects of economics that generate well-being for planet, people, purpose and profit. Karl is a cultural catalyst and visionary, passionate about co-creating communities embodying peace, justice, and sustainability. For 22 years, he has been catalyzing transformational learning experiences in settings ranging from universities and corporations, to ecovillages and urban gardens. Ferananda Co-Directs VillageLab and is internationally recognized in the fields of collective intelligence and the next economies. The center of her work is conscious evolution and systems design. She facilitates for organizations in Europe, Mexico and the USA and consults in intentional community design using an integral model she developed. Jeff has enjoyed 36 years as a leader in intentional community design, appropriate technology, and new economies. Jeff co-founded the Ecovillage Network of the Americas and was Ecovillage Director at Sirius Ecovillage and is now Co-Director of VillageLab. Jeff’s passion is the design integration of the social, economic and ecological aspects of community. Jamaica Stevens is an experienced community organizer, project manager, workshop leader and public speaker, group facilitator, event producer, writer and life coach. Author and Project Manager of “ReInhabiting the Village". Jamaica works with Whole Systems theories empowering people, projects and organizations to THRIVE! Come one, come all, bring a guest, and Reinhabit the Village! Spirit: We offer this workshop in the spirit of win-win reciprocity. We will offer as much value as possible in grace - putting the fullness of our hearts and Spirits and wisdom from our combined life experience into this very special event - and we ask you do meet us in that Spirit. Suggested Donation: $120-$500 - No one will be turned away for lack of funds.Transparency: We strive to have at least 20 people at this event. Our fixed costs and minimum requests from workshop leaders totals $3000 or a minimum $150 per person assuming 20 attend. That said - no one will be turned away for lack of funds or level of donation and the identity of donations will be kept confidential. Consideration and Process: We ask that you keep the fullness of the collective economics in mind - including that some may not be able to afford the suggested minimum yet will not be turned away. If required we will facilitate a process that empowers us all to find that right amount that rings true to our hearts and minds in all ways.